A Chinese national flag raises at Sha Tau Kok border in Hong Kong, April 4, 2016. Twenty years after China resumed sovereignty over Hong Kong, Beijing’s message to the city is a stark one: you only have the freedom to do as we please. Zhang’s speech—and similar remarks by other mainland officials and academics in recent months—represents a dramatic break from the “One Country, Two Systems” doctrine under which Beijing had pledged to run Hong Kong. The contours of the formula—as laid down in the Sino-British Joint Declaration of 1984 and in the Basic Law—were designed to reassure jittery residents and nervous investors alike: a “high degree of autonomy,” except in foreign affairs and defense; an independent judiciary; protection for fundamental rights and civil liberties; and a path—albeit one deliberately left vague—to democratization. To such observers, Zhang’s remarks should come as a rude awakening—and a signal that China’s Hong Kong policy has shifted from one of covert influence to one of overt control. Zhang’s public repudiation of separation of powers as applicable to Hong Kong, and his assertion of the power to “supervise” Hong Kong officials based on their allegiance to national sovereignty, risk fatally undermining judicial independence and the political neutrality of the civil service—both fundamental tenets of the territory’s administrative and constitutional order. Worse, Zhang’s invocation of “implicit powers,” and his threat to “go into further details” about Beijing’s consolidation of sovereignty over Hong Kong, amount to a blank check to intervene in matters that should be within the city’s autonomy—acts prohibited by Article 22 of the Basic Law. Adding insult to injury, Zhang exhorted judges, officials, and academics to study the Basic Law. With its track record of torturing rights lawyers, the notion of mainland China lecturing a sophisticated common-law jurisdiction about learning the law should attract derision. But an examination of exactly what sort of “study” Zhang wants Hong Kongers to emulate suggests that alarm might be a more appropriate reaction. 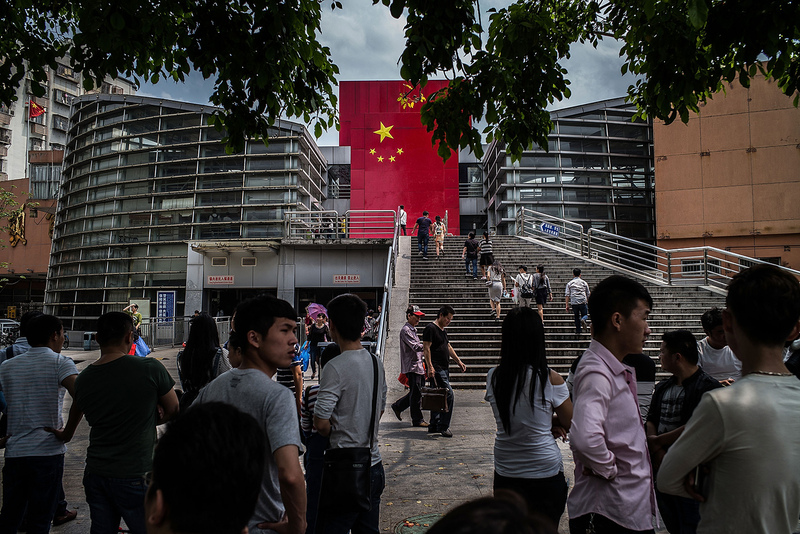 In light of China’s ever-tighter control over its academics, it is not surprising that much of this scholarship is devoted to hard-line, punitive prescriptions rather than any independent or genuine attempts to understand “One Country, Two Systems.” Rao Geping, a law professor at Peking University, called for interpretations of the Basic Law by the National People’s Congress Standing Committee—widely condemned as interfering with Hong Kong’s judicial independence—to become a regular practice. Chen Duanhong, another Peking University professor, has called for Hong Kong residents of foreign nationality who supported the pro-democracy Umbrella Movement to be expelled from the territory. And Wang Liwan, a former colleague of mine at New York University now at the China University of Political Science and Law, has suggested that the Basic Law’s protections for freedom of expression be “interpreted” to exclude any form of “advocacy for Hong Kong independence,” a term he uses to tar the entire spectrum of political opposition in Hong Kong. Admittedly, academic opinion does not translate directly into official policy. Nonetheless, it would be surprising if such views did not enjoy broader support from mainland officials in charge of Hong Kong policy. Unless incoming Chief Executive Carrie Lam pushes back (her refusal to take up the bookseller abductions suggests that she is unwilling, and perhaps unable, to do so), there is a real risk that Hong Kong’s formal institutions may become stripped of any substantive meaning. There is a time-honored way to describe such arrangements: a puppet regime. In that light, Zhang’s speech on May 27 may not be so much a celebration of “One Country, Two Systems,” as a death sentence. It is difficult to know exactly what Xi Jinping intends for Hong Kong. But my experiences here in the last few days suggest an unprecedented top-down eagerness to stifle the freedoms that make Hong Kong what it is, combined with a bottom-up eagerness to protect these basic freedoms. Last night, I watched an elderly woman holding an image of Liu Xiaobo attempt to leave a vigil for the Nobel laureate outside the Court of Final Appeals, walking upwards toward Government House, where Xi Jinping was having dinner. Police tried their best to block her, for no apparent logical reason—Xi is after all undoubtedly so sheltered that there was little chance of his tender eyes being offended by this not so offensive image. Shouting arguments broke out—“is this Beijing? No, this is Hong Kong.” And indeed, this is still not Beijing. She was able to proceed eventually, albeit followed by at least a half a dozen anxious policemen—a slightly disproportionate response, to state the obvious. Tonight, I was to participate in a rally for the Hong Kong National Party, a pro-independence party that was established in Hong Kong last year. The rally, in my analysis, served as a barometer for free speech in Hong Kong, based on the idea that it is after all only controversial speech that needs to be protected. The organizer, Chan Ho-tin, applied a week in advance, as is required, for approval from the police for the gathering. Approval was not granted. The main reason provided was that the gathering violated Article 1 of the Basic Law which states that Hong Kong is a part of China. Other articles that guarantee freedom of speech and assembly were ignored: one country yet again took precedence over two systems. The rally, now officially an “illegal assembly,” was originally to be held at the clock tower next to the Star Ferry Pier in Tsim Sha Tsui. In what was presented as a pure coincidence, maintenance work was scheduled for the area tonight, meaning that the entire square around the clock tower was fenced off. When I passed through the area tonight around 8:00 p.m., as people gathered for the nightly light show on the harbor, these blockades created a clearly unsafe situation, with crowds flowing outwards onto the busy streets. Such safety concerns were secondary to ensuring that this one rally did not take place. To state the obvious again, I did not see any maintenance work taking place at the site. With the clock tower blocked off, the rally’s location was initially moved to a square in East Tsim Sha Tsui. Once Chan arrived at this site, dozens of police followed. He was informed that if he did not leave the square by 6:00 p.m., he would be detained for holding an “illegal assembly.” Faced with the absurd possibility of being detained for an illegal assembly at which he was the sole person in attendance (the event was not to start until 8:00 p.m.), the organizer left. Again, this isn’t Beijing. Eventually, the event was held at Hong Kong Baptist University, sponsored by the Student Union. Nothing untoward occurred: a number of university students gave speeches on their grim understanding of China’s control over the city. All was peaceful and orderly, and when the event ended, everyone went home. Two trends stood out to me in the course of these events that I observed firsthand. The first was the sheer determination of officials and police to prevent this rally regardless of the amount of manpower needed, regardless of the clearly preposterous excuses for the police actions, and regardless of the inconveniences placed upon visitors to Tsim Sha Tsui. The second trend, parallel to this extra-legal approach to crushing a gathering, was the need to maintain a veneer of legality. In a process that was clearly an act of political discrimination and silencing, the Basic Law, which is supposed to protect the rights and freedoms of the people of Hong Kong, was instead weaponized to infringe upon these rights and freedoms. The Basic Law was, in effect, being violated in the name of protecting the Basic Law. Both of these trends reflect broader currents in Beijing’s rule over Hong Kong in recent years: the increasingly politicized policing and prosecution of activists, and the perpetual twisting of the Basic Law to mean whatever Beijing wants it to mean. Is this what Xi Jinping intends for Hong Kong? I was speaking with a friend after the gathering who said with some confidence that Hong Kong was still under the control of the “Jiang faction,” and that Xi Jinping’s visit could signal an assertion of his control over the city, providing the possibility of change, or at least a softer line. I wish I could be optimistic enough to believe such analyses. I can only say that if Xi’s visit is a sign of a potentially softer line on Hong Kong, the obsessive securitization, suppression of free assembly, and military parade are certainly curious ways to signal such a shift. Rather, in my analysis, the problem is not factional but systemic: there is no way within the current political system for the people of Hong Kong to effectively make their voices heard, and Xi Jinping shows no sign of correcting that. It is this systemic issue which is on the one hand driving the bottom-up rise of localist and independence-leaning thought, while on the other hand driving the top-down crackdown on newly emerging forms of activism. And I see no easy way to break out of this vicious cycle. Xi Jinping’s, or more accurately, Beijing’s long term intentions for Hong Kong are twofold. On the one hand, Beijing has been anxious to establish absolute control over the politics and society of Hong Kong, ensuring that Hong Kong would not develop into a hotspot of subversion of C.C.P. rule. On the other hand, Beijing wants the world, the U.S. in particular, to maintain its formal recognition of Hong Kong as an autonomous entity separate from mainland China regarding visa and immigration, export-import control, and capital flow, etc. As such, the Chinese government and individual Chinese officials could do all sort of things internationally under the convenient cover of a distinct Hong Kong identity. It is an open secret that many Chinese officials can freely move their money and relatives to Western countries under the cover of being “Hong Kong money,” and “Hong Kong residents,” and that China can get a hand on a lot of sensitive technologies and foreign capital via the Hong Kong channel despite all kinds of regulatory hurdles restricting mainland China’s access. Needless to say, there is a great tension between the two intentions. If Beijing goes too far in reversing Hong Kong’s freedom, the U.S. and other Western countries will find it too difficult to pretend that Hong Kong is still autonomous from China. In such a case, the U.S. would have to revoke its recognition of Hong Kong’s distinction from mainland China under the U.S.-Hong Kong Policy Act, and other countries would follow. It would have dire consequences for the Chinese economy and the fortunes of wealthy Chinese officials. In the first decade after Hong Kong’s sovereignty transfer, Beijing seriously restrained its impulse to clamp down on the civil liberties and political opposition in Hong Kong. This restraint is illustrated by Beijing’s shelving of Article 23 anti-subversion legislation after the massive demonstration in 2003. After about 2008, Beijing, perhaps out of the perception that its global power has outgrown those of the U.S. and Europe, started to see such self-restraint as unnecessary. Beijing seemed to expect that Western countries, humbled by China’s new financial and geopolitical muscles, would pretend that Hong Kong is still free and autonomous no matter what. Since then, Beijing has tightened the screw. Beijing arbitrarily disqualified select opposition candidates for Legco and even elected legislators, bringing the beginning of the end of the territory’s free and fair elections. It resorted to cross-border kidnappings to silence some of the most critical voices. It has effectively controlled all electronic media and nearly all print media. And so on. Yet, these infringements of rights and autonomy invoked little more than a few toothless lines of concern in some Congressional reports from the U.S. and the near negligence of the U.K. If the world continues to be reluctant to respond to the erosion of Hong Kong’s freedom by ending or threatening to end the recognition of Hong Kong’s autonomy, Beijing will eventually bulldoze Hong Kong’s “One Country, Two Systems” to nothing more than name without any price to pay. That will be a triumph of Beijing. But it will be a tragedy for the freedom of Hong Kong and for the credibility and interests of the U.S. and the international community. Since he became General Secretary of the Chinese Communist Party at the end of 2012, Xi Jinping has had one over-arching ambition—to centralize authority on the Party and on himself as its incarnation. For him, that is the key to achieving the China Dream and warding off the threat of a Soviet-style implosion. For all the exhortations to study Marx and Mao, this is not an ideological quest but a drive for power accumulation pursued through the Party and to be pursued by whatever means the leadership regards as appropriate. It should be no surprise if Xi and the central administration he heads should wish to fit Hong Kong into that framework. If the former colony slots in of its own accord, so much the better. If not, the power calculus is quite clear. For a lengthy period after the 1997 transfer of sovereignty, Beijing was prepared to adopt a fairly relaxed attitude towards the former British colony. That encouraged the belief that the second of the Two Systems provided for under Deng Xiaoping’s formulation had a special force, and would continue to do so for the 50-year period laid down in the handover agreements. But, in keeping with the broad trend of policy under Xi, Beijing has made it clear that what counts most is the One Country start to the formulation. For it, the first two words outweigh the last two. So, if Hong Kong is to retain its freedoms, that will be because the central authorities allow it to do so. As Xi made clear in his speech on the 20th anniversary, anything perceived in Beijing to threaten the way the leadership chooses to run the People’s Republic will be suppressed. The Joint Declaration is now dismissed by the Foreign Ministry as a historic document that no longer has binding force. The central authorities reserve the right to act in the Hong Kong S.A.R. as they see fit, basing their legitimacy—if they feel the need for justification—on the One Country. What this does not take account of is the polarization of opinion and the increased militancy of the pro-democracy. Xi and those around him cannot be expected to retreat. They may seek to play the S.A.R. through Carrie Lam and her colleagues in order to make the most of the remaining benefits which the Golden Goose has to offer the P.R.C. But they see Hong Kong as part of the broader armory of power constructed at the center during the past five years and likely to be reinforced in Xi’s second term after the Party Congress. Twenty years on, the former colony has moved from regarding itself as a special case, a city with unique strengths and a broad degree of international support, to occupying a subordinate role in the calculations of Zhongnanhai. How its people live with that will be the test of the years ahead, but the comforting four-word equation of 1997 has given way to a harsher relationship hardly disguised by the color of the anniversary. Under the terms of the Sino-British Joint Declaration, Hong Kong was promised a “high degree of autonomy” and that its “social and economic systems” and “lifestyle” would not change for fifty years. However, it is important to understand how Beijing interprets these phrases before we look to rely on them as guarantors of Hong Kong’s rights and freedoms. Those British negotiators and Hong Kong citizens who took comfort in the phrase “high degree of autonomy” may have failed to realize that Beijing also refers to Tibet and Xinjiang as “autonomous” regions, using the same Chinese characters zi zhi (自治). From the Chinese point-of-view, the mere existence of a local government constitutes “autonomy,” and there is nothing about the concept that gives such local government the unfettered right to do as it pleases with no deference to Beijing. As for the famous fifty years, contemporary commentators—with the benefit of hindsight—like to point out how wrong history seems to be proving those who argued that in the 63 years between 1984 and 2047 the Mainland would “converge” with the West generally and with Hong Kong in particular. To be sure, the Mainland does not appear to be on the path to liberal democracy. But in terms of their “social and economic systems” and “lifestyles”, the Mainland has largely “converged” with Hong Kong: remember that in 1984 the Mainland was still running a Marxist planned economy, and then just go to a shopping mall in any large Chinese city today. It is in the vitally important area of fundamental values that the gap remains largest. For the Chinese Communist Party, two things are sacrosanct: China’s territorial integrity, and the continuing rule of the Chinese Communist Party over that territory. Everything in the Joint Declaration and the Basic Law, including terms like “autonomy”, must always be seen through that lens. What Xi was saying, if it wasn’t already clear from recent years’ events—the abductions of booksellers and businesspeople, the disqualification of unruly legislators—was that Beijing will not tolerate Hong Kong being used as a base for activities that undermine the interests of the Party. Thus the key question for Hong Kong’s future is: what constitute the interests of the Party for this purpose? Obviously it includes publishing subversive materials and distributing them into the mainland. It also includes advocating independence for Hong Kong, although how active such advocacy must be before it crosses the “red line” remains to be tested. Demonstrators still waved “Hong Kong Independence” banners with impunity at the march on July 1, although as Kevin Carrico has pointed out, their attempts to hold their own rally were defeated, probably without legal basis. In Beijing’s view, the “red line” also encompasses advocating any form of self-determination, which is seen as a back door to independence. My concern is that, as we keep inching along this path, we may very quickly reach the point where criticizing the Hong Kong government itself (which represents Beijing and its interests in Hong Kong) is considered yet another means of indirectly undermining China’s interests. Inevitably, this will lead to constraints on the rights to free speech and assembly, meaning the end of the right to protest and the end of a free and unfettered media. Most alarming of all is that—for appearance’s sake—Beijing would likely seek to do this within the framework of Hong Kong’s existing laws, putting pressures on the judiciary and our legal system that would irreparably “break” Hong Kong’s rule of law. At that point Hong Kong and the mainland will truly have converged. I have puzzled over this question since at least the summer of 2014. As the politics engulfed the city, I would often half-joke that the purpose of the One Country, Two Systems arrangement was to protect Hong Kongers from needing to learn how to read the proverbial ‘tea leaves’ in Beijing and or learn the speculative art of Zhongnanhai ‘Kremlinology.’ The spirit and indeed the words of both documents were designed to insulate Hong Kong for 50 years from future political storms blowing across the mainland. It is clear that Xi does not recognize these political firewalls. Three years after the White Paper and the 8/31 Decision, there is still no compelling explanation for why C.Y. Leung was told not to run for a second term or why Beijing became intent on defeating John Tsang’s bid for Chief Executive. Events such as the 'newspaper war,’ which predicted the downfall of C.Y. Leung but also of Liaison Office chief Zhang Xiaoming last winter, add to the confusion by making public the existence of deeply acrimonious factions within the Party. It belies a more fundamental question than what Xi intends for Hong Kong: is any single person or group is in charge of managing Hong Kong policy? Alvin Cheung quotes Zhang Dejiang, but it remains unclear how much Zhang speaks for himself or Xi and how serious we are to take his pronouncements. Where elsewhere Xi has moved to centralize policy to consolidate his rule, he appears instead to have outsourced Hong Kong policy to factions with different views on Hong Kong. At one end of the spectrum is a group of hardliners who have mastered the practice of creating endless cycles of instigation, unrest, and crackdown since 2014. They appear as eager to push for Article 23 legislation, to re-introduce some form of compulsory Moral and National Education, and to further criminalize pro-independence speech and activities as they are disinterested in considering the consequences. That these policies are not yet being vigorously pursued, and that C.Y. Leung was asked to stand down, suggests the existence of a more moderate faction or some unknown moderating influence on policy making. What Xi intends for Hong Kong is likely governed on the one hand by a desire to stop hearing about the city and on the other an inability to plan and execute policies that might do that. He appears driven by faith in convictions and principles that interact antagonistically with consideration to details and nuance. His leadership style has worked well across the border, but in deciding to play a heavier hand in Hong Kong than any of his predecessors he has chosen to operate in a political landscape unlike anything he has experienced before. Hardline policies interact with a civil society protected by broad-based civil rights his predecessors signed into law 20 years ago. He has let hardliners who share his principles define his government’s policies. His inauguration speech this week to was only more evidence of his conviction that displays of strength, ever more centralized control, and marginalization of dissent will make his Hong Kong problem go away. Whether he and his ‘learning party’ can come to see that these are also seeds that plant more problems, and future resistance, is the question at hand. In Hong Kong, a proper dose of cynicism is healthy and helpful in understanding Chinese politics, but excessive cynicism dampens Hong Kong’s spirit and impedes a constructive dialogue that is much needed for Hong Kong to move out of the current impasse. Did President Xi come to Hong Kong to deliver a harsh and intimidating message? Clearly not and there is no need for him to do so. Having expressed these security concerns, Xi delivered three positive messages that are significant for Hong Kong. First, Xi reminded the people in Hong Kong of the city’s glorious past and of the fact that Hong Kong has made outstanding contributions to China. Xi could have gone one step further to make a stronger statement that China’s economic miracle would not have been possible without Hong Kong’s helping hands. Xi said China acknowledges and appreciates Hong Kong’s contributions. That thank-you note from Xi resonates well in Hong Kong. Personally, witnessing all the attacks and occasional insults from the Mainland in the past few years, I have been waiting for someone to acknowledge Hong Kong’s historical contributions. And Xi has now just done this. Significantly, Xi’s sympathetic note has its own rippling effect. Following Xi’s speech, netizens in the Mainland started to post and repost photos and messages to reflect Hong Kong’s generosity and aid to China when needed. Liberal-leaning scholars in the Mainland, who have been silent in the past few years, came out to forcefully defend Hong Kong’s position. For many in Hong Kong, Xi’s speech could be the right tonic Hong Kong needs to boost its ability to conquer predicaments that it faces. Second, Xi affirmed the centrality of the Basic Law in Hong Kong governance. Yes, he said one country is the root in the One Country Two Systems design, but he also said, unprecedentedly, that Hong Kong’s capitalist system, together with the political system and social system to support it, is also an integral part of the Chinese system. China practices One Country Two Systems and the Central Authorities are determined to implement the policy firmly, accurately, and comprehensively. Of course the Basic Law is at the heart of the constitutional relationship between the Central Government and Hong Kong. Xi’s speech is likely to reconfirm the centrality of the Basic Law and to end the extra-Basic Law political excess that has manifested itself in the mainland, typically involving over-cooked, high-pitched denigration of Hong Kong. Finally, Xi expressed a high degree of tolerance for political dissent and opposition, with conditions, as mentioned above, attached of course. He endorsed pluralism and diversity within Hong Kong society; and he reiterated the commitment that anything, presumably including constitutional reform and democratization, can be discussed and debated as long as the discussion and deliberation take place within the framework of one country and on the basis of the Basic Law. There may be nothing new about those reconfirmations and commitments and they may amount little more than political strategizing when a new enemy, the independents, has appear on the horizon. But they are nevertheless refreshing and reassuring after so much antagonism has filled the political space between Hong Kong and Beijing over the past many years.